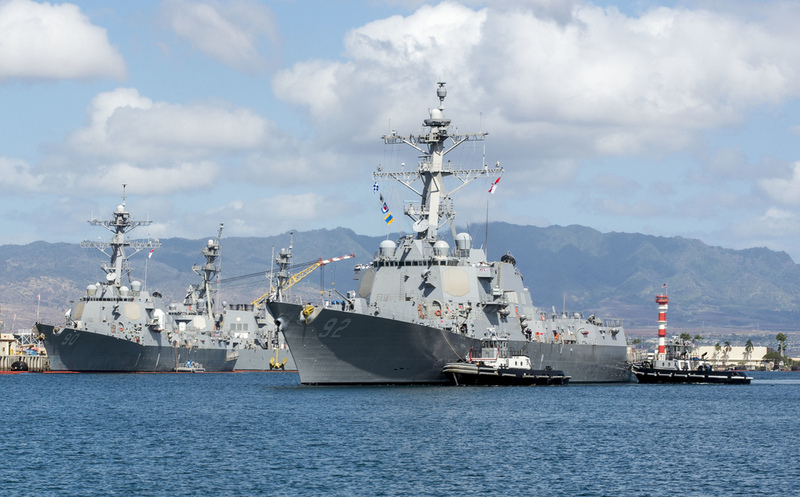 PEARL #HARBOR, - A Pacific Surface Action Group (PAC SAG) departed Joint Base Pearl Harbor-Hickam April 27 following a port visit en route to the Western Pacific. The PAC SAG is comprised of the embarked staff of Destroyer Squadron 31, guided-missile destroyers USS Spruance (DDG 111), USS Decatur (DDG 73) and USS Momsen (DDG 92) and embarked “Devil Fish” and “Warbirds” detachments of Helicopter Maritime Strike Squadron (HSM) 49. Adm. Scott Swift, commander of U.S. Pacific Fleet, addressed Sailors from the crews aboard Momsen April 26 to highlight the significance of their mission and explain how their capability will be tested throughout their deployment. Deploying as a PAC SAG allows the three ships to execute a broad range of maritime operations in the U.S. 7th Fleet area of operations while under the operational control of U.S. 3rd Fleet. During WWII, the vast majority of 3rd Fleet was forward deployed throughout the Pacific islands in campaigns all the way up to Japan. “This deployment is a little bit of returning to your roots; our roots of having 3rd Fleet deploying forward through this PAC SAG, throughout your entire cruise,” said Swift. The destroyers are trained and prepared to conduct maritime security operations, which include addressing challenges to international law at sea such as piracy and other illicit activities. The PAC SAG will conduct routine patrols, maritime security operations and theater security cooperation activities, and will also operate with regional navies to promote security, stability and prosperity. The guided-missile destroyer USS Momsen (DDG 92) arrives at Joint Base Pearl Harbor-Hickam for a scheduled port visit. Momsen, USS Spruance (DDG 111) and USS Decatur (DDG 73) are part of a Pacific Surface Action Group on mission to conduct routine patrols, maritime security operations and theater security cooperation activities to enhance Western Pacific regional security and stability.